Jamie Foxx (Nathaniel Ayers), Robert Downey Jr. (Steve Lopez), Catherine Keener (Mary Weston), Tom Hollander (Graham Claydon), LisaGay Hamilton (Jennifer Ayers (as Lisagay Hamilton)), Nelsan Ellis (David Carter), Rachael Harris (Leslie Bloom), Stephen Root (Curt Reynolds), Lorraine Toussaint (Flo Ayers), Justin Martin (Young Nathaniel), Kokayi Ampah (Bernie Carpenter), Patrick Tatten (Paul Jr.), Susane Lee (Marisa (as Susane E. Lee)), Marcos De Silvas (Mayor Villaraigosa), Ilia Volok (Harry Barnoff). Directed by Joe Wright and produced by Gary Foster and Russ Krasnoff. Screenplay by Susannah Grant, based on the book The Soloist: A Lost Dream, an Unlikely Friendship, and the Redemptive Power of Music by Steve Lopez. When I first saw the trailers for The Soloist, I thought two things: that it looked like the potential award nominee that time forgot, and that it looked as emotionally manipulative as all get out. Now that I’ve actually seen the film, I stand by the second inclination. Robert Downey, Jr., continuing his streak of popular starring roles after Iron Man and Tropic Thunder (both 2008), is Steve Lopez, a columnist for the Los Angeles Times in search of a story. He is at odds with his bitter wife and editor Mary (Catherine Keener), has a college-age son by her, and as the film opens he has a bad crash on his bicycle, leaving him badly bruised and scraped. Then one fateful day, Lopez met a man who was truly down on his luck. 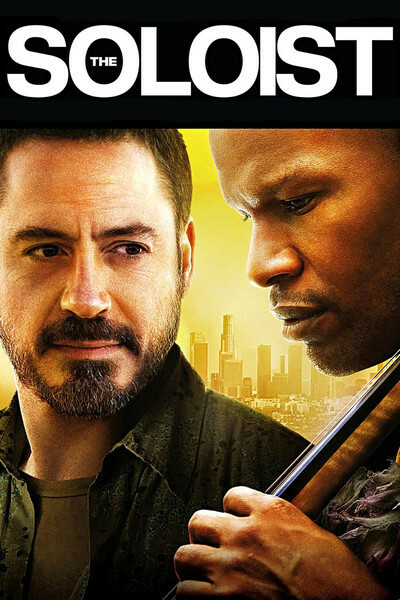 Nathaniel “Anthony” Ayers, Jr. (Jamie Foxx) is a (possibly) schizophrenic man playing a violin with two strings in a concrete park in the middle of L.A. Lopez is intrigued, thinking there may be a story here – if he can cut through the static of insane rambling and nonsense that is Ayers’ uncontrollable habit. Lopez writes of Ayers, an elderly woman who has been crippled with arthritis sends Lopez her cello for Ayers to play (free of charge), and Lopez becomes a kind of keeper of the poor, homeless street urchin. We get flashes of Ayers’ childhood and hints at what may have driven him to the place he’s in – physically, emotionally and psychologically. Meanwhile, in the present, Lopez gets Ayers into a Skid Row homeless community center called LAMP, and finds himself thrust into and out of frustration at Ayers’ condition – as are we. The film was directed by Joe Wright (Pride & Prejudice, Atonement) and written by Susannah Grant (Erin Brockovich), based on the book by Lopez. As I feared from the first trailer on, the film is meant to be a melodramatic tearjerker using “cinematic mental illness” as more of a plot device than a genuine subject. Unfortunately, as a result, we learn less about Ayers and his life than we might like. His illness is unpredictable – whatever it is. As someone who has lived and dealt with mental illness in his family, I suppose I could relate to that, but it makes for something of an underwhelming cinematic experience. Curiously then, the film is rather dramatically inert. The performances do the best they can with the material, particularly Foxx, who may have thought this was another potentially Oscar-nominated performance in the making. Unfortunately, the material and its treatment never really rise to the occasion. The film is beautifully made, and Wright has already proven himself a capable filmmaker; interestingly, this is his first non-British, non-period piece and doesn’t star Keira Knightly. The fault then is with the adaptation of the “true story-based” material, which is problematic at best, flawed at worst. Still, if you aren’t expecting a transformative and inspiring experience, the film is just about engaging enough to recommend – with serious reservations.